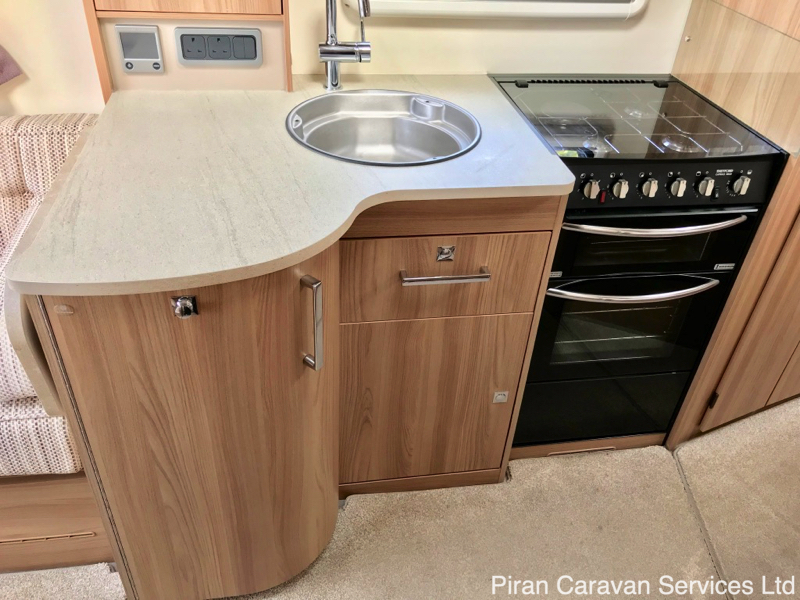 Are you looking for a top of the range caravan, with the reputation of being one of the most well-designed and most well-equipped caravans on the market, with a fixed bed layout which doesn't compromise on space, equipment or luxury? 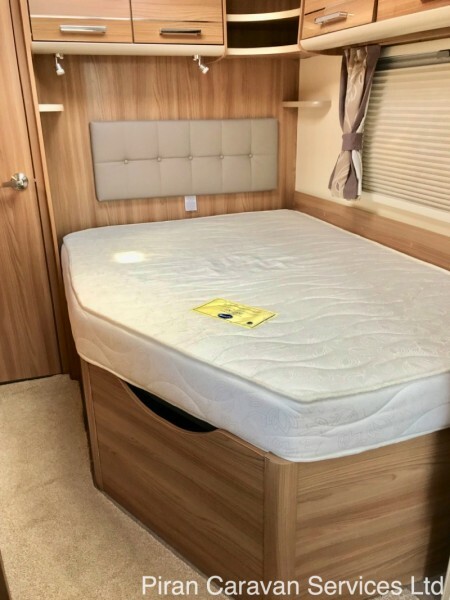 Bailey's flagship Unicorn 3 Valencia, featuring a spacious lounge, top spec kitchen, super comfortable fixed bed and big end washroom will meet all your requirements. 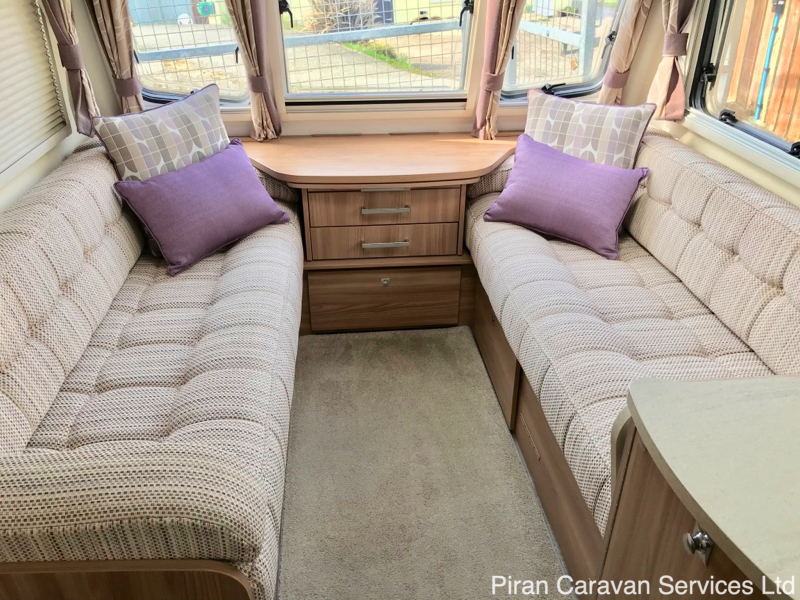 This 2015 Bailey Unicorn Valencia, is presented in excellent external and internal condition, coming from a smoke and pet free home. 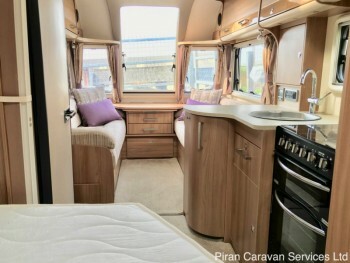 It is CRiS registered, comes with full service history and all its original owner's manuals and will be fully serviced and damp-checked by an independent approved workshop specialist, prior to sale. It is being sold with lots of extras making it exceptional value for money, including a Fiamma 4 metre canopy, additional fitted water drain down system, a working remote control motor mover, Al-Ko secure wheel lock, Aquaroll, waste pipe, caravan step, hook up cable, 2 x gas bottles, Avtec TV, hitch cover, and a brand new 85ah leisure battery with a 3 year guarantee. 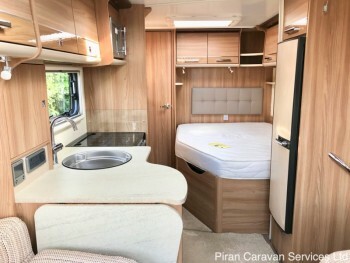 This spacious single axle caravan provides the ultimate in touring comfort and will suit couples looking for the ultimate in space and comfort or families with children, who will use the lounge seats as single beds. 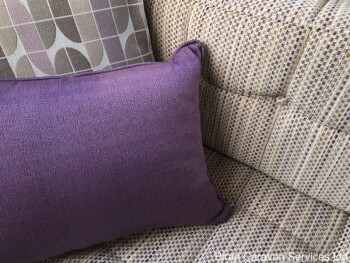 It is also great on a seasonal pitch for use as a holiday home. 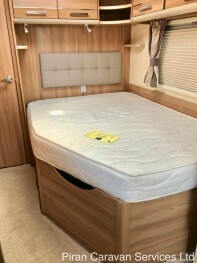 Bailey stated that their new 2015 flagship Unicorn range was designed "to maximise available interior space whilst maintaining an accessible unladen weight, ensuring that the Unicorns are as practical as they are comfortable.” With a combination of superior 'Alu-Tech' construction, luxurious interiors featuring Bailey walnut furniture and a five- star equipment list including Alde central heating, it's easy to see why Bailey said that the 2015 Unicorn was designed for today's modern caravanner. 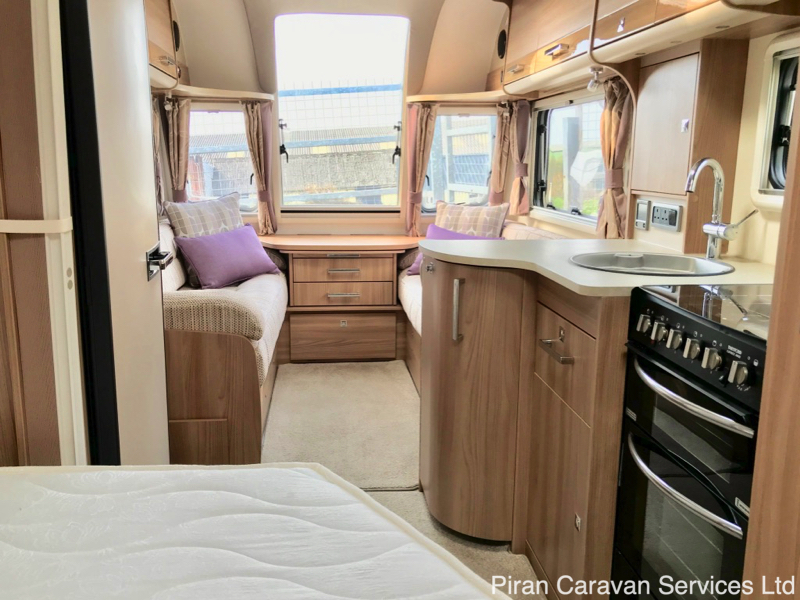 The top of the range Bailey Unicorn S3 models are a superb choice on the secondhand market, for caravanners who don't want to compromise on luxury. Externally, Bailey described the Alu-Tech Body Shell Construction as the most significant development in caravan design for over thirty years. This fully bonded 5-part shell assembly method is lighter and stronger than traditional construction and has enhanced thermal performance. 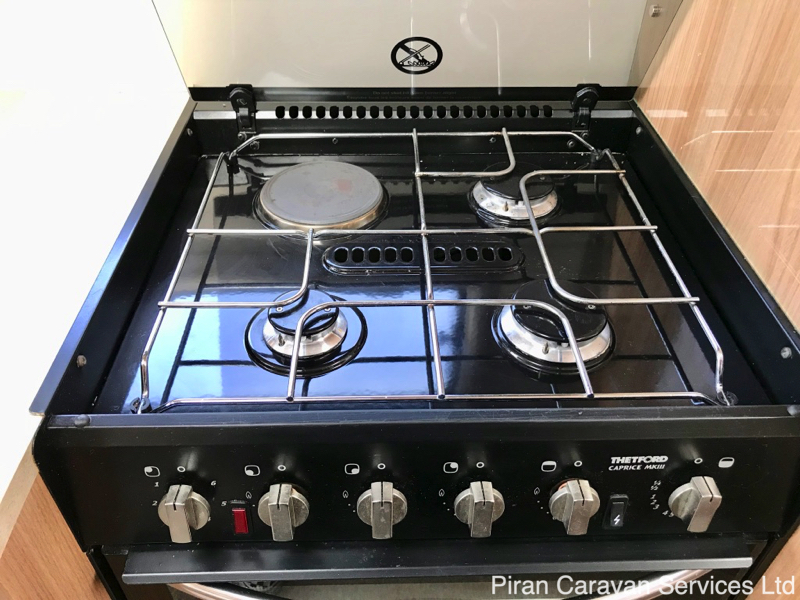 When combined with Grade 111 and Alde heating, this caravan will be completely comfortable and warm in the depths of winter, with year-round touring guaranteed. The body-shell is built on a twin-axle Al-Ko galvanised chassis, featuring 15" alloy wheels, Al-Ko 3004 stabilising hitch, Al-Ko caravan jack, shock absorbers and chassis mounted spare wheel carrier. 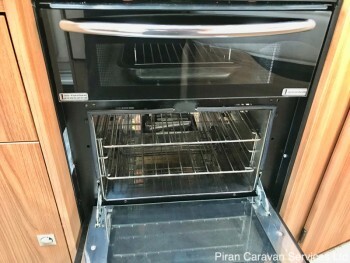 The caravan has Al-Ko Secure wheel lock receivers for complete security. 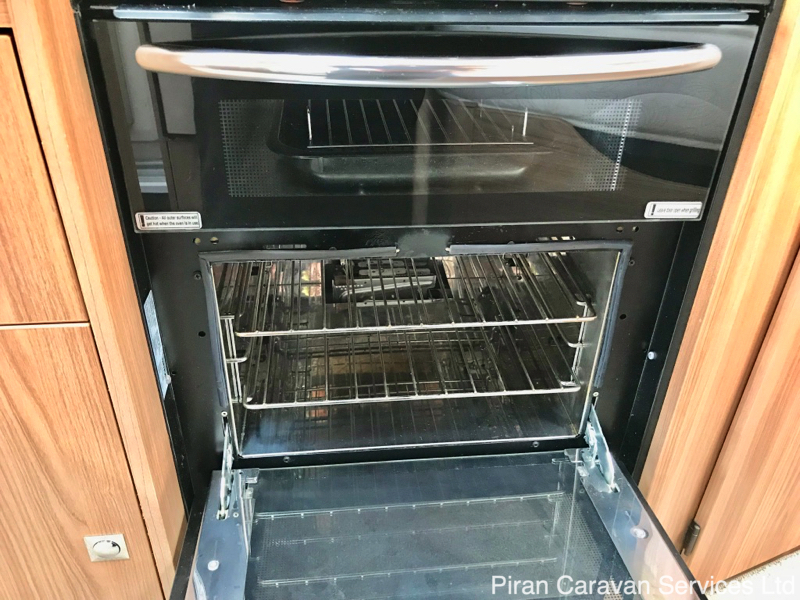 There is a gas-assisted hand brake and the caravan is fitted with 13 pin towing electrics and there is an external Gas BBQ point. The icing on the cake is the factory addition of Al-Ko ATC electronic trailer control (click here to find out more). 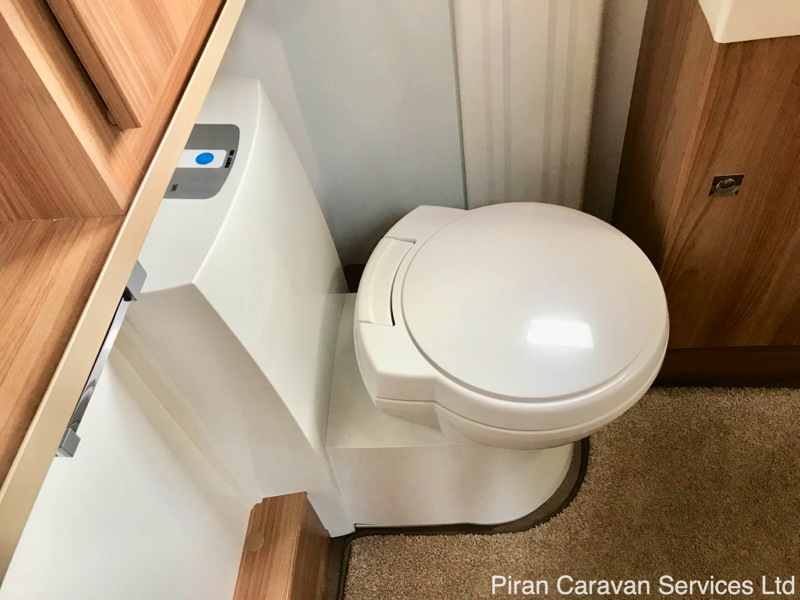 On the exterior, bold, attractive graphics set off the gloss white exterior, which features external lockers for 12v hook up, leisure battery, toilet cassette, gas bottle and storage, are set off by striking alloy wheels. 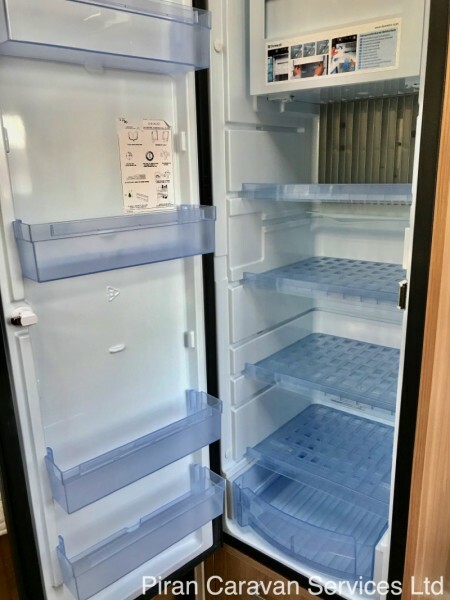 A large aperture two-part Hartel door leads to the impressive interior. 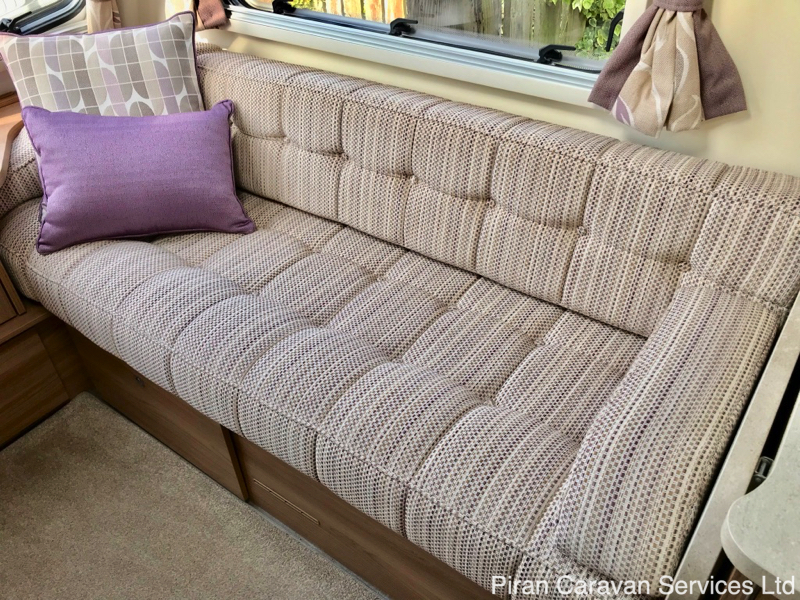 At the front of the caravan, 3 double-glazed windows with fly-screens and Horrox pleated blackout blinds provide a panoramic view from the spacious lounge area. 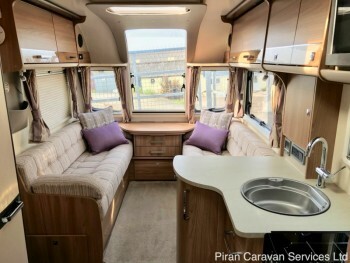 A large curved panoramic window provides a spectacular view from the lounge. In the lounge, two bench seats can be used as single beds or converted into a large double bed (6'8"x 4'6") using the pull-out slat system and feature fully sprung upholstery and high density filling in a wraparound configuration. There is a useful chest of drawers with a slide-out coffee table and a separate folding table is provided which allows seating around the table for 4. The upholstery is finished in premium 'Mozart' design fabric and is complemented by matching curtains, bolster cushions, scatter cushions and drop in carpets, creating a 'home from home' feeling. Storage is provided under the seats and in the overhead aircraft-style lockers. 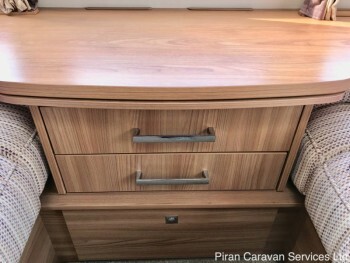 The lockers and the furniture elsewhere in the caravan has an Italian design and is finished in attractive Bailey 'Walnut' veneer with brushed silver handles. There is a combination of 230v and flush fit 12v L.E.D. 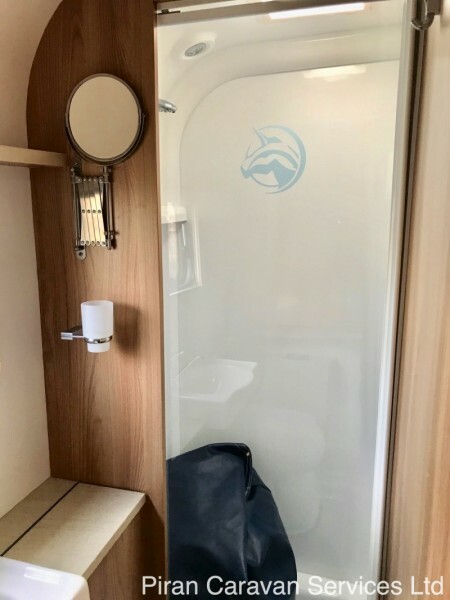 ambient and task lighting in the lounge and throughout the Unicorn Valencia and a Heki 2 rooflight in the lounge ceiling provides plenty of light and ventilation. A branded CD radio with MP3 connectivity and built-in speakers provides musical entertainment to suit your taste! 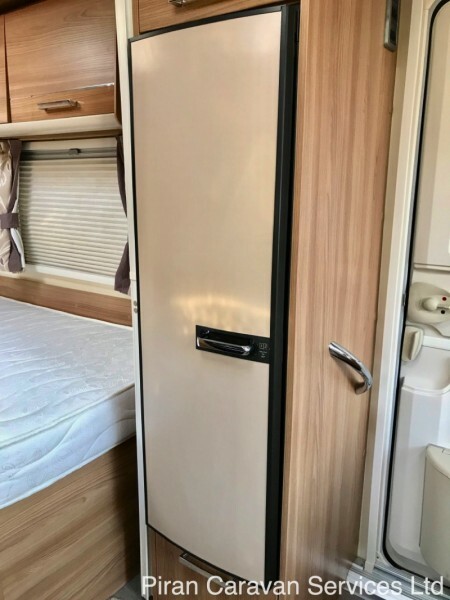 Moving back through the caravan, there is a well-appointed kitchen with a Dometic fridge with detachable full-width freezer compartment. A Spinflo recessed 4-burner hob unit incorporating flush fitting hinged lid with conveniently located controls and Spinflo combined grill and domestic style glass fronted oven with electronic ignition ensure all catering requirements are met from a simple breakfast to a full evening meal. 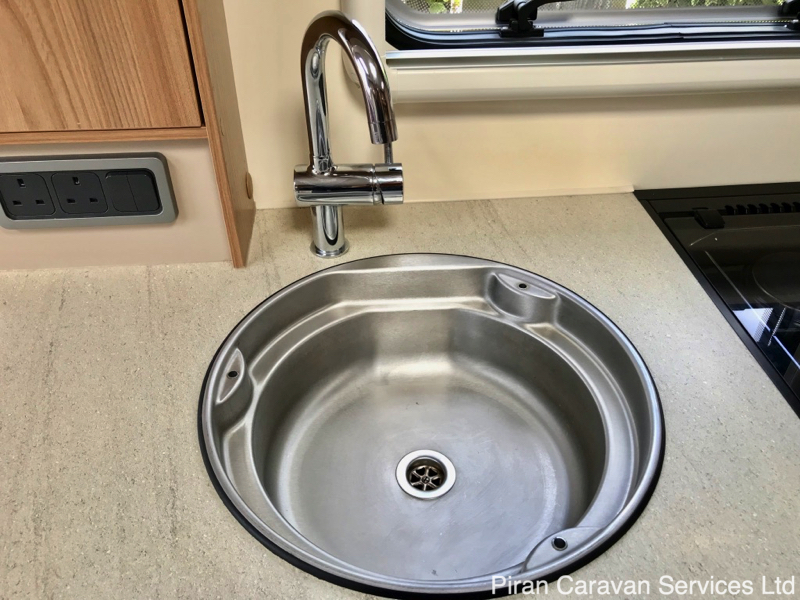 The kitchen is also equipped with a Spinflo kitchen sink with removable drainer, chopping board, washing up bowl and chrome finished tap. There is also handy built-in Daewoo stainless steel 800 watt microwave oven, and attractive overhead lockers in walnut finish and a useful worktop area for meal preparation. Opposite the kitchen is a tv point with 12v, 230v and aerial sockets and clear tv reception is provided by the Status 530 directional aerial and more storage below. 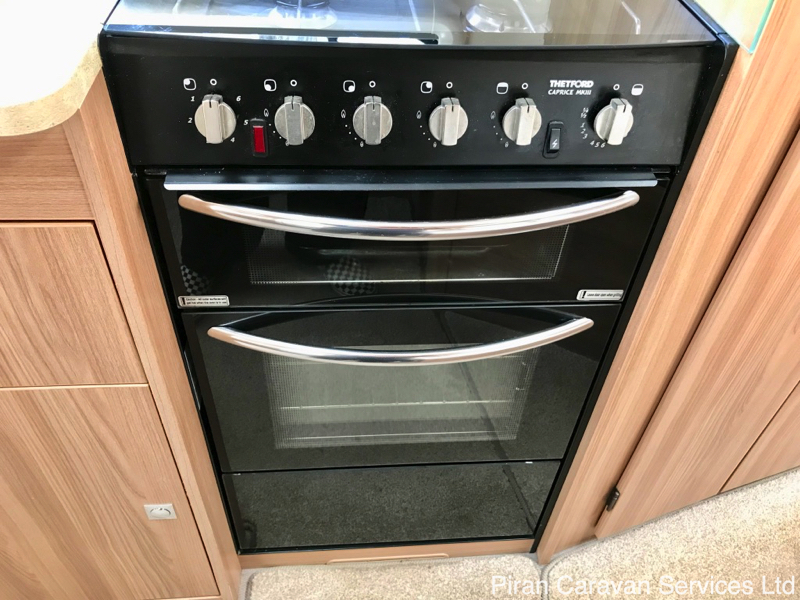 The Unicorn range boasts the inclusion of upgraded heating and hot water to the ALDE Hydronic Compact 3010 programmable radiator heating system, with combined water heater, supplying hot water to the kitchen and washroom. 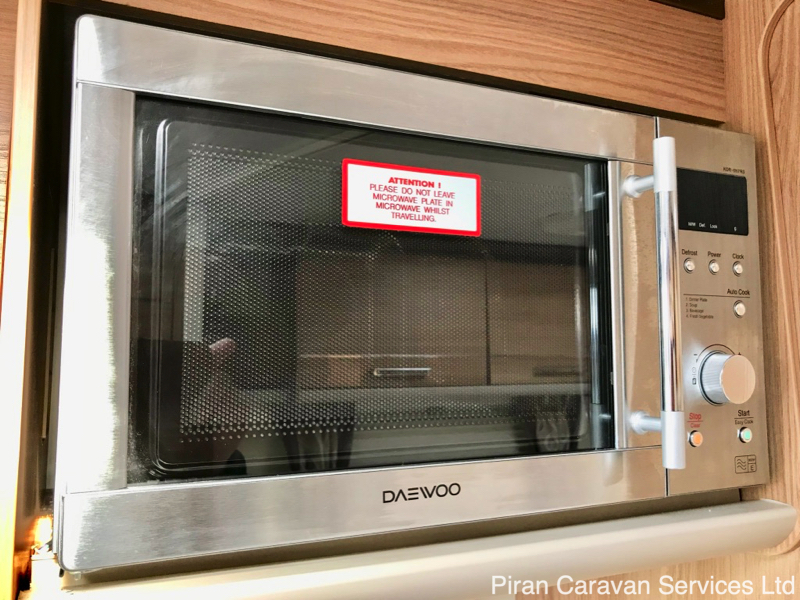 This system gives the owner complete temperature control in the caravan, with the ability to program the heating to come on and go off at specified times of the day, as with a domestic central heating system. Combined with grade 111 thermal insulation, the Unicorn 3 Valencia can be used for year-round caravanning in complete comfort. 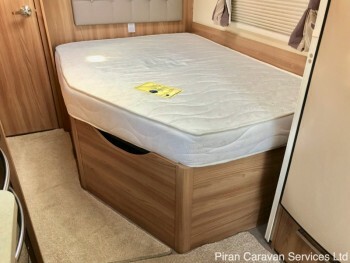 Moving further back, there is a spacious fixed bed with luxury sprung mattress and mattress protector, on a hinged space-frame, which allows access to the large under bed storage area. 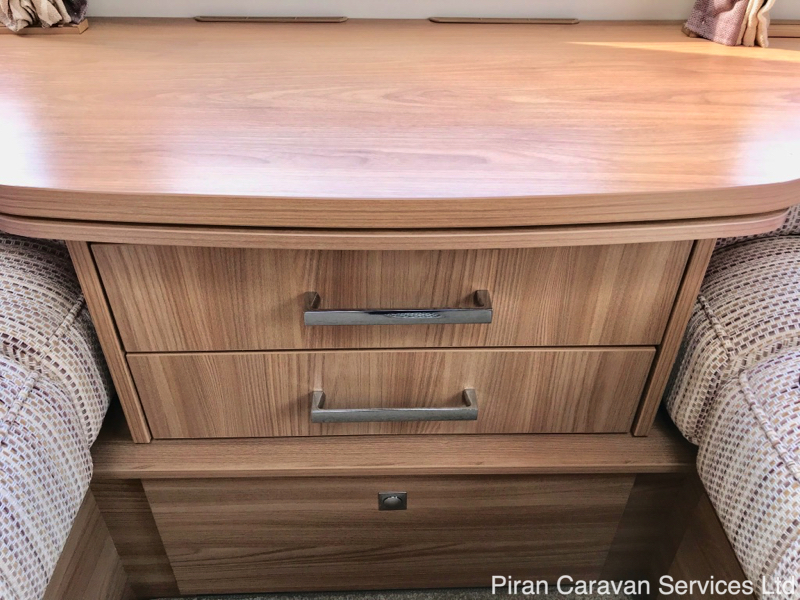 In the bedroom, which can be separated from the rest of the caravan by a privacy screen, is a corner wardrobe with hanging rail and more overhead lockers in a walnut finish. 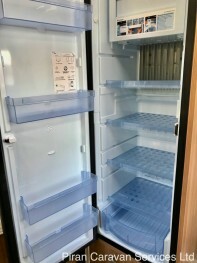 There are also 12v L.E.D. reading lights. 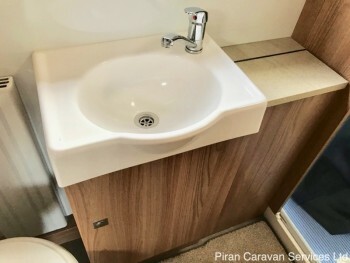 At the rear of the caravan, a domestic style door leads to the impressive end washroom, which features a 'Belfast' style sink and chrome mixer tap, walnut finish vanity unit, Thetford c-250 cassette toilet with electric flush and a separate, fully-sealed shower unit with chrome mixer tap and shower head. 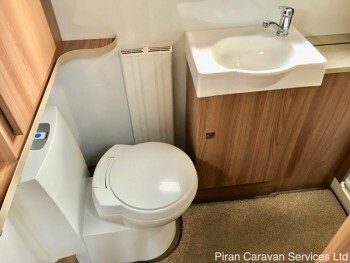 The washroom suite is gloss white which contrasts well with the walnut furniture and there is even a heated towel rail! 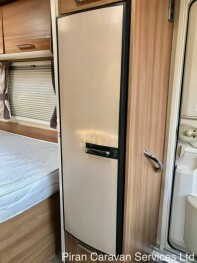 For security, the Unicorn Series 3 Valencia comes with a Tracker alarm. In summary, a great value spacious, practical and modern top of the range caravan, with a desirable fixed bed/end washroom layout, which will provide warm, comfortable and luxurious caravanning holidays all year round with a 'home from home' feeling for couples or small families who will appreciate the extra luxury provided in a Unicorn. 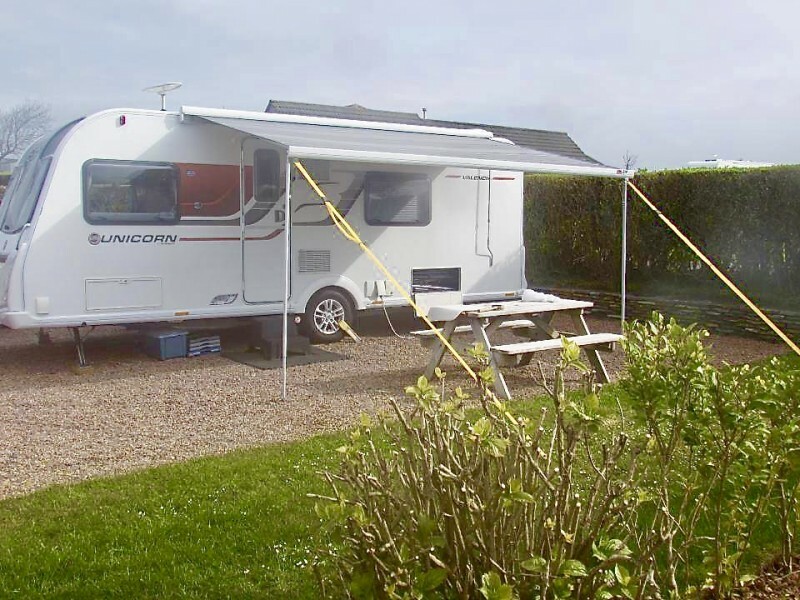 To view the 2015 Bailey Unicorn Series 3 brochure click here.